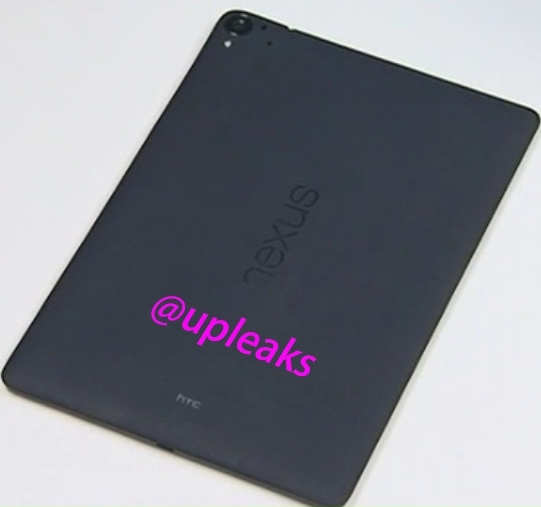 HTC's upcoming Nexus tablet for Google has leaked again in pictures. This time courtesy @upleaks, the latest image shows the back of the tablet. Contrary to some of the rumors, the T1 does not have a metal body but instead the same matte black plastic back with a circular raised camera lens in the top left corner, which looks very similar to the design of the Nexus 7 and the Nexus 5. Even the big Nexus logo is similarly placed sideways in the middle. We already knew the tablet would have a 4:3 aspect ratio display, and this image once again shows the squarish shape of the device. The launch of this device is supposed to be this month itself so hopefully we will find out more soon.